The Dogo Argentino is a large heavily muscled dog bred for hunting big game such as wild boar. The breeds fearless attitude makes it a sought after breed for protection as Dogo Argentino's will not hesitate to fight to the death to protect their owner. 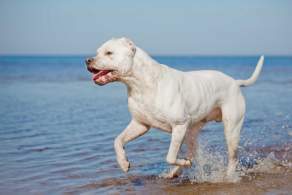 Despite to breed's intimidating appearance, the Dogo Argentino was bred as a companion breed so they get along with other pets and children and attacks are rare. However, like most dog breeds, the Dogo Argentino should be socialized at an early age to prevent any aggressive traits from developing. Below are the characteristics and traits of the Dogo Argentino dog breed. The Dogo Argentino is a large dog breed. Males can weigh up to 110 pounds and be as tall as 30 inches from the ground to shoulder. All Dogo Argentinos should be solid white with no markings. The breed is heavily muscled and sturdy. Many people compare the breeds appearance to the American Bulldog and American Pit Bull Terrier. Dogo Argentinos are loyal dogs who feel their job is to guard their home and family. They are playful and extremely affectionate of children and their family. Although they were bred from aggressive dogs, the Dogo Argentino should not show any aggressive traits unless provoked or threatened. The breed does well with other pets, however they will not back down from another dog provoking them. The breed has a very short coat (some portions of their body may have patches with very thin hair) making it easy to take care of. The Dogo Argentino will need to be brushed weekly and bathed as needed. The breed needs high amounts of exercise to keep their body in it's athletic condition. 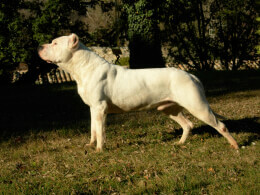 This breed is a relatively new one, and while the Dogo Argentino history is rich, it is rather short. The foundation took place in 1928 when two brothers, Antonio and Agustin Martinez of Cordoba, Argentina desired a dog that could give the Fighting Dog of Cordoba the following: the Boxer's gentle demeanor, the fearlessness of the Bull Terrier, the Bulldog's boldness, the lockjaw power of the Dogue de Bordeaux, the Great Dane's size, the wild game hunting instinct of the Irish Wolfhound, and the Pointer's extraordinary sense of smell — and so much more. They also wanted a dog that, despite all these fearsome hunting, fighting and guarding traits, could be trusted to be a family companion. Unfortunately, Antonio's dream was cut short when, in 1956, he was murdered during a boar hunt by a man who intended to rob him. Agustin didn't hesitate to maintain the brothers' project; by this time, he was the Argentine Ambassador to Canada, and he levied this influence to introduce the dog to the rest of the world. To this day, the dog is known in Canada as a hunter of moose. 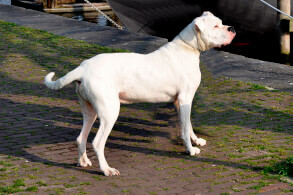 As the breed gained popularity worldwide, the Dogo Argentino Club of America was formed (1985), the AKC allowed the dog into its Foundation Stock Service (1996) and the UKC formally recognized the dog in 2001 by placing the breed in the Guardian Dog Group. Ten years later, in 2011, the AKC allowed the Dogo Argentino another step toward formal recognition by granting a Working Dog registration. 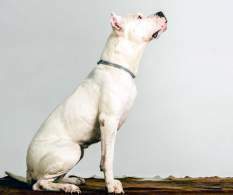 Due to the dog's fighting background and what breeds make a Dogo Argentino, the breed has become a very popular in dog-fighting circles, an aspect which has prompted it to be misappropriated for illegal dog fights and to be poorly bred as well as badly managed — and listed on the banned dogs registers of several countries and regions. The Dogo Argentino is without a doubt a brutally athletic breed. The seemingly smiley face quickly gives way to a well-muscled head, neck, and body that solidly states strength. 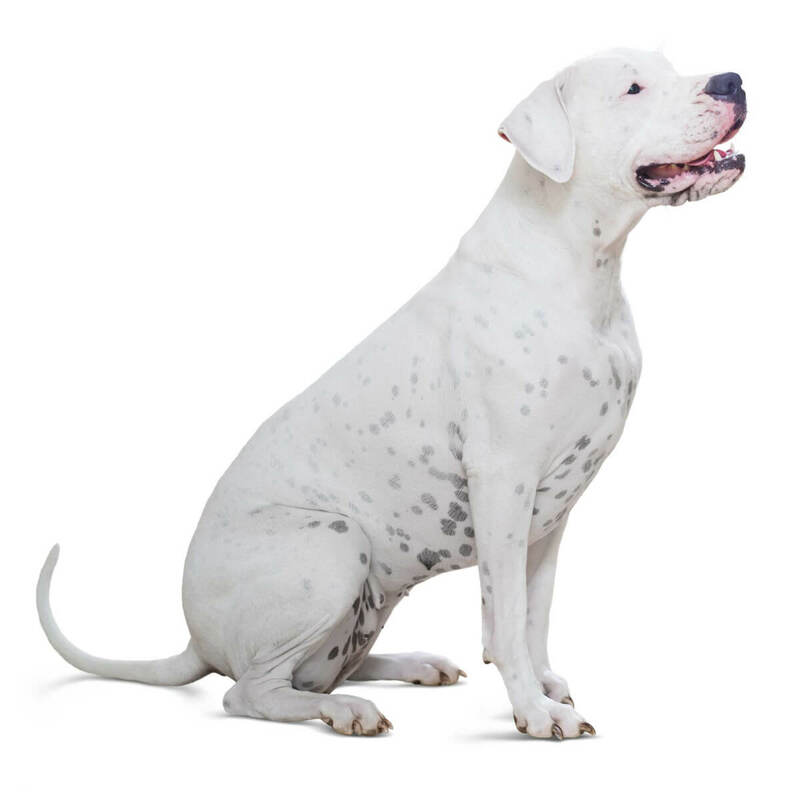 Dogo Argentino ear-cropping is called for by the breed standard, but you'll find many Dogos with their full, floppy ears instead. From the black nose back to the bald eyes, the large, strong jaw juts out solidly from a round head and is set on a neck covered with some wrinkly skin. This all leads down to the deep chest, powerful legs, and a barrel-shaped body that ends in a strong tail which tends to hang down. The coat is short, coarse and single-layered. There are no other Dogo Argentino colors than white. Although there may be some pigmentation that shows through as the dog ages, and usually there is one spot on the head, this breed is basically pure white. If you are told that a breeder has a black Dogo Argentino, then it is a mix or simply not a Dogo. It's the same for any alleged brindle Dogo Argentino: there are none. 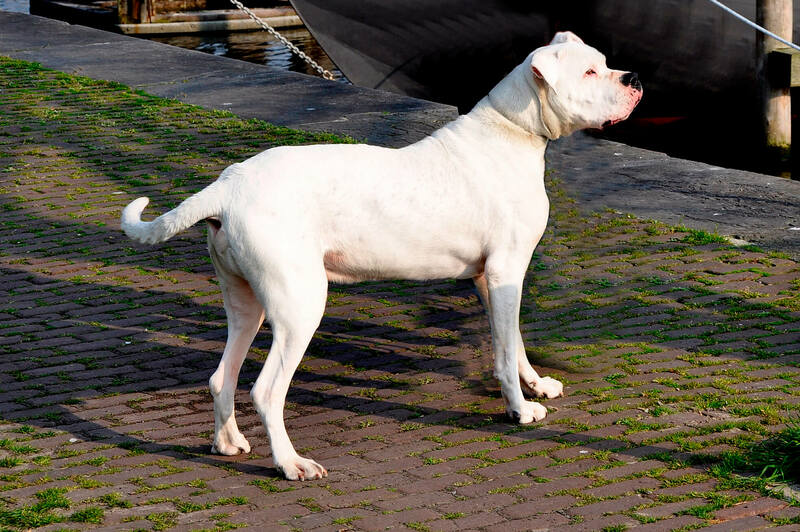 The Dogo Argentino height and weight place them in the large size category. When fully grown, males stand from 24 to 27 inches tall, and females have a slightly shorter range from 24 to 26 inches. Mature males reach a range of 80 to 100 pounds, and female Dogos are a good bit smaller on the weight chart at 75 to 88 pounds. Note, the typical male requires about three years before he is fully grown while females usually require no more than two years. 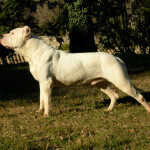 As a relatively new breed, this newness may prompt some to seek what breeds are in a Dogo Argentino. There are a great many breeds that contributed to produce this dog, and they are discussed elsewhere on this page in the history. 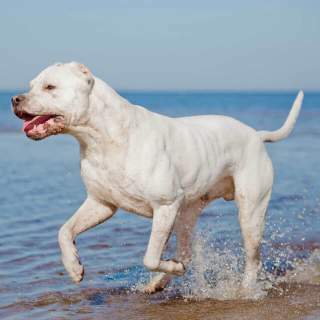 There may be those who want to know the biggest Dogo Argentino, but even that dog is sure to be not far above the typical range-- they are big dogs, to be sure. There are no variations recognized in size, coat color, or style. 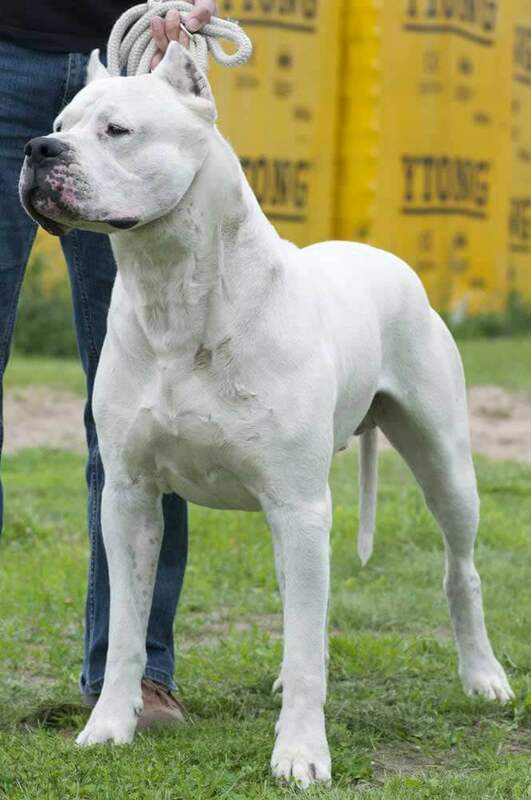 One thing that you should understand about the Dogo Argentino temperament is that this breed is not the dangerous dog that is all too often in the news. Although the breed is highly assertive in her attitude, rather suspicious of strange things and is extremely protective of her property and loved ones, it is only a relatively few nefarious dog breeders (and the disreputable people who hire them) who have been responsible for marring the millions of otherwise good dogs. To be sure, these dogs are hunters, trackers and accustomed to a wild lifestyle — but when properly trained, socialized and cared for, they are excellent home companions. They are intelligent enough as well as great guard dogs, wonderful playmates, and good watchdogs. You must be firm and fully confident, however, for they require a true alpha to guide them lest they become that alpha. If you wish to have a Dogo Argentino family dog, you should read between the lines of the news that tells you about the very rare dog attacks. There are tens of millions of these dogs, and there are just a few bad guys who use, abuse and let loose these dogs — and so very few actual attacks. She will be a member of your family so you should set aside no less time than you do any other family member. If you do this, you'll find that this breed will live relatively well with your kids as well as be an excellent watch- and guard-dog. Dogo Argentinos around babies and unsteady toddlers should always be supervised (as with all breeds). Below are pictures of the Dogo Argentino dog breed. The Dogo Argentino has moderate separation anxiety, doesn't bark much unless she's alone and a stranger approaches too closely, and regards those she doesn't know with suspicion. Despite not having the typical separation anxiety, these dogs still desire companionship; like all animals, they will seek destructive ways to burn off loneliness, unspent energy and all that. While they can deal with apartment living, it is ideal to have a house with a decently sized yard and very secure fencing. If you live in an area where there are squirrels and other small feral and / or wild animals, your Dogo will be sure to give chase. Then there are those who may first be concerned with the answer to the question that all people who want a dog ask: "Is the Dogo Argentino hypoallergenic?" This breed is not, and while they have short-haired coats, they do shed a fair amount as well.